Home Auto Insurance Guides Help! How Do I Change My Oil? Help! How Do I Change My Oil? 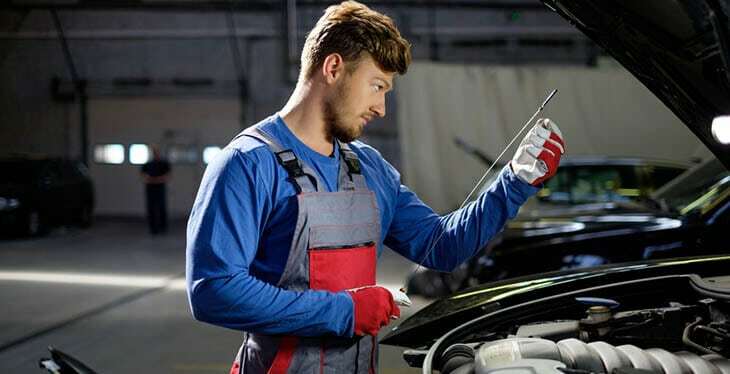 Unlike changing a windshield wiper blade or putting air in your tires, changing your own oil can be a little challenging — and a lot messy. So why do it yourself? One reason is cost. Getting your oil changed by a mechanic will set you back around $46, on average, or as much as $70 if your vehicle uses synthetic oil. Here’s one way to think about it: How much is your time worth? Let’s say you pay $50 to have your oil changed by a pro, or you could pay $12 for five quarts of conventional oil plus $8 for an oil filter and do it yourself. If you change your own oil, you’re essentially paying yourself $30. Another reason to change your own oil: You’ll know it’s done right. I once saw an odd bulge in my hood after an oil change. When I lifted it, I saw that the quick-lube technician had removed the cap of the windshield washer fluid tank and left it sitting on the engine. I was lucky it didn’t leave a permanent dent in the hood. Not only that, but quick-lube places have been caught time and time again trying to fleece customers by up-selling them on services they don’t need. All right. Ready to do this? Here’s how to change your oil, step by step. Step 1. Get all the tools you’ll need to change your own oil. The correct amount and type of oil for your vehicle. Find this info in your owner’s manual, and don’t fudge it! 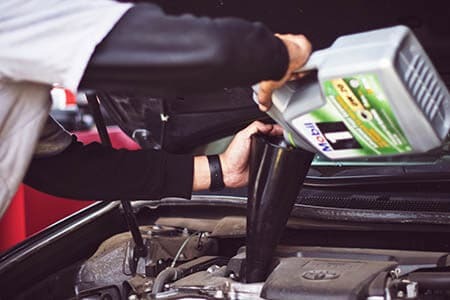 Buying the wrong kind of oil (synthetic vs. conventional, for instance) or putting in the wrong amount can damage your car. Most vehicles take 5 to 8 quarts of oil, depending on the size of the engine. The correct oil filter. Don’t buy the cheapest one you can find, experts warn. If your car is designed for longer oil change intervals (6,000 miles), pick an extended-performance filter. An oil filter wrench. This handy little tool removes the type of filter that spins on, helping you grip it even when it’s oily. Some car makes, such as BMW and Volvo, may require a specially shaped wrench. A box-end wrench. You’ll need this to remove the drain plug. Get the right-size wrench, not an adjustable one. A funnel. A water-cooler cup or small plastic water bottle with the bottom cut off will work fine. Plastic sheeting to cover the driveway or garage floor. It’s easier to prevent oil spills than to clean them up after they happen. Step 2. Safely raise the front of your car. First, run your car for a few minutes to warm up the oil. Then park your car on the plastic sheet, on a level surface. Put on the parking brake. Most importantly, remember that it’s not safe to be under a car held up only by a jack. Say it with us: It’s not safe to be under a car held up only by a jack. We don’t want you getting smushed. And we bet, neither do you. Instead, use vehicle ramps or jack stands to securely raise the front of the car. Once you’ve done that, put two tire chocks behind the rear wheels. Step 3. Drain the old oil. Slide under the car and locate the plug on the oil pan. Allow several minutes for all the oil to come out. Wipe the drain plug with a rag — does it look OK? Once the oil’s gone, replace the drain plug, without over-tightening. Step 4. Replace the oil filter. Move your oil catch pan under the filter to catch any drips. Then loosen the filter with your handy filter wrench, letting the oil drain out. Pull off the filter, making sure the gasket comes off too. Rub a little new oil on the gasket of the new filter, then screw it in by hand. Step 5. Add new oil. Wondering how to add new oil? This is the easiest part. Remove the oil-fill cap under the hood and, using your funnel, add the manufacturer-specified amount of oil to the tank. Replace the fill cap and the dipstick (you didn’t lose it, did you?). Step 6. Check your work. With the car still raised up, run the engine for at least 30 seconds. Then, check for leaks around the filter and the drain plug. If you see any, turn off the engine, then inspect and retighten. Once the oil has settled, check the floor beneath the car for leaks too. Don’t see anything? Good job! Lower the vehicle and check the oil level with the dipstick. Step 7. Recycle the oil and filter. Only bad people dump used motor oil down the drain. You can drop off the old oil and filter at a local oil-change center or a municipal landfill for recycling. IRecycleOil can show you the nearest place near you. Now that you’ve successfully changed your oil, here’s another way to save some money: Spend a few minutes comparing free, personalized car insurance quotes on Compare.com. You may find cheaper premiums, a better policy, or both!